Martin Guggenheim ’71, Fiorello LaGuardia Professor of Clinical Law, has a problem with the way our society approaches child welfare. In particular, Guggenheim believes that working to rehabilitate entire families should take precedence over efforts that focus solely on children’s rights. His views on such topics inform his work as a scholar—he wrote What’s Wrong with Children’s Rights (2005)—and as codirector of the Family Defense Clinic with Adjunct Assistant Professor of Law Christine Gottlieb ’97. The clinic represents the adult relatives of children removed from their homes by Family Court. Clients, including parents accused of child abuse and neglect, often suffer themselves from addiction, illness and poverty. Like other NYU clinics, this one is interdisciplinary. In addition to Gottlieb, an attorney in private practice who is formerly a lawyer with the Juvenile Rights Division of the Legal Aid Society, Guggenheim is also joined by a social worker. The three supervise law students and master’s candidates at the NYU School of Social Work as they help clients try to recover their family lives. The advantage of this collaboration is that the law students get to know their clients better, and the team is better able to ascertain the client’s needs and develop a plan to get the client what he or she needs in terms of legal and social services. Other organizations, including New York’s Center for Family Representation and South Brooklyn Legal Services, have replicated Guggenheim’s interdisplinary model (see related stories on pages 6 and 42). Guggenheim’s 17 years of work with the clinic have helped create a cadre of young lawyers who share his views about the best way to approach the problems of child welfare. He makes no bones about his social justice agenda, which has had an important impact on the lives of former clinic students such as Heather Howard ’97, policy counsel to New Jersey Governor Jon Corzine. 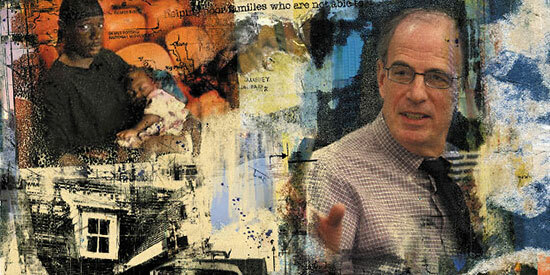 Howard has spent the past decade working to develop public policies that strengthen families. “Usually, everyone talks about children’s rights, but I like to get people thinking about defending families’ interests,” she says.